LAUNCHES THEIR SPRING 2013 COLLECTION. 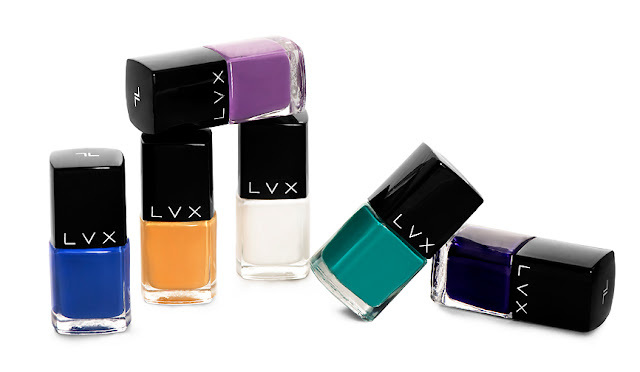 LVX nail lacquer announces the release of their fourth debut collection. Chicago (February 2013): With immense anticipation of an “emerald” release in nail lacquer, LVX debuts the stunning gemstone for Spring 2013. Emerald, named Color of the Year for 2013 by Pantone, is this season’s it color. LVX’s adaptation of this amazing color is vivacious and will intensify any outfit. The luxury vegan brand continues to stun us with their distinct and bold seasonal palettes. Effective Spring 2013, LVX will debut a new and updated bottle. The new sleek design will display the colors more vividly. The overall size and shape has not changed, however due to the thicker glass, the new fill capacity will be 15ml. The long lasting, chip resistant and non-streak formula is free of harsh and toxic chemicals. LVX products are VEGAN and formulated without the use of Formaldehyde, Formaldehyde Resin, DBP, Toluene, and Camphor. LVX is a no compromise nail lacquer that has superior formulation, is socially responsible and eco friendly. LVX nail lacquer is cruelty free. All products are produced in the U.S.A. The new collection will be available March 1st 2013 on www.shoplvx.com. the purple one is gorgeous!